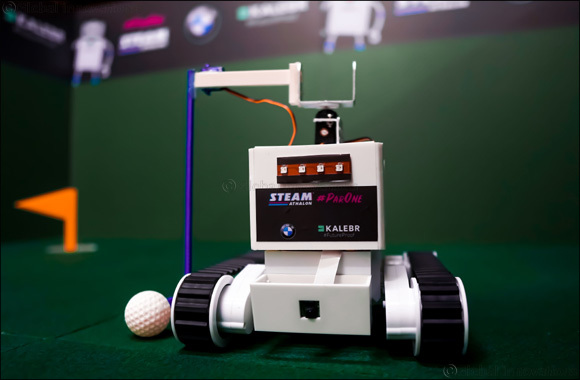 Dubai, UAE, April 08, 2019: On April 25th and 26th the UAE's very first ParOne Invitational STEAMathalon will take place at The Els Club, in association with Canada's leading Ed Tech company, Kalebr, BMW Middle East and Dubai Autism Center. ParOne STEAMathalon showcases a world-first, but how exactly does it work? Open to Grades seven, eight and nine across the UAE, teams of young learners will train their very own artificial intelligence GolfBots to golf pro status, competing against other innovative learners from around the country as they traverse a custom 9-hole mini course. Alongside GolfBot’s AI model training, learners discover the magic of tolerance, express their creativity and build real, relevant and valuable interpersonal skills, while competing in a sports setting. Young learner teams will be scored on innovation, creativity, sustainability, positivity and their AI project as a whole. Empowering and engaging learners with 21st-century workplace skills, the grassroots premise of STEAMathalon is that learners discover, innovate, market and celebrate. Innovation is part of the pillar 'United in Knowledge' of Vision 2021 which focuses on building a competitive economy. Several initiatives have been launched to help drive the UAE forward to be among the best innovation countries in the world by the golden jubilee of the union. H. H. Sheikh Khalifa bin Zayed has also declared 2019 as the Year of Tolerance and among its aims seeks to solidify the UAE as the global capital for tolerance through initiatives and projects that spark dialogues between diverse cultures in a respectful environment. Many schools in the UAE and around the world wish to promote innovation as part of their core curriculum and not just as an extracurricular activity. However, successfully integrating innovation within the curriculum raises important questions such as: How to bring other educators on board? How to plan the lessons? How to assess the STEAM lessons? How to promote Tolerance? The 2019 ParOne Invitational STEAMathalon aims to promote AI x Tolerance x Sports in schools, while also demonstrating best practice on how to achieve this. STEAMathalon introduces the future of education through competitive play-based innovation league, raising the bar for positive education, happiness, wellbeing, social impact and 21st-century skills. Designed to 'future proof' students in Kindergarten through to Grade Twelve and beyond, STEAMathalon focus on science, technology, engineering, art, and math, positive education, making, coding, UN Sustainable Development goals and citizenship within the core curriculum.